Cupcakes 'n Daisies: Birdseye View . . . . .
My favorite has to be the log cabin that I'm working on now-my first log cabin, but not my last. It is a retreat quilt and king size to boot. Not my usual colors, I wouldn't have picked them myself, but it is going to be beautiful. 120 blocks! Have about 48 left to do. I also love stars-my first ever finished quilt is a star quilt and I have both of Miss Rosie's books, but have yet to make a quilt out of one of them-someday! Thelma, by the end of your blog I was hooked...I have to make that quilt! I usually choose to make smaller cuddle quilts, but it's just so gorgeous! And I love that you have travelled blogworld to find some others that have done the same quilt. My favorite quilt pattern is all of them! But seriously, one that I go back to time and again is Lucky Stars by Atkinson Designs...all I need is 12 fat quarters and some background fabric and I'm off and running. I make the kids size (45 x 60) which is a perfect cuddle quilt and use flannels or brushed cottons...the better to cuddle with! You are so generous with this giveaway...fingers crossed...now to go order the pattern! oh I am always inspired by what you make and HOW FAST you are! I too set deadlines for projects, helps me stay focused most of the time. I have at agree this pattern has been on my list too, I LOVE nine patches and stars so this pattern is knew i had to make. I needed to find the right fabrics for it and move it up the list. My favorite pattern to make is still a nine patch block or a star block. Thanks for a wonderful giveaway, if I win you can count on me making it right along with you ! My favorite quilt pattern is usually either the one I am working on or the one I am planning to start soon. My current favorite is from Sue Abrey's "Pick Four" called "Stepping Stones." Pat Wys' "Spotlight on Neutrals" came in the mail yesterday. I have my eye on "White Chocolate." But there is the matter of the material patiently waiting to become Sue Abrey's "Antique Nine Patch." Then I saw Lesley's comment on "Lucky Stars" by Atkinson Designs, a pattern and remembered my love for that pattern. Okay. So I have difficulty picking a favorite. I will just keep quilting! I do believe Carrie Nelson's "Birdseye" would be perfect! Happy quilting! Do I really have to pick one?!? I have two favorites: Elizabeth by Miss Rosie and Evangeline by Paula Barnes. I just finished Evangeline and I'm hoping to make Elizabeth in the coming months. Birdseye is also at the top of my list since I absolutely love love love nine patches. What a wonderful, generous giveaway! There are so many quilts I want to make and I'm so, so slow! All your quilts are beautiful. My favorite pattern right now is the one I'm making, Spaghetti Junction by Heather Mulder Peterson. Have a book of Miss Rosie patterns and one of them may be next on my agenda as I'm apparently the only quilter in the entire world who hasn't made one! My favorite pattern is always the next I will make... I see it,fall in love and I have to order fabrics immediately ! wonderful quilt ! And Birdseye is a wonderful name for a quilt too! Those Birdseye quilts are gorgeous. Love them all. My favorite right now (it changes with each quilt) would be my feathered star. At the moment I love Swoon but I also love Plan C (by Carrie) - I don't usually use patterns though so I'm not very au fait with many of them...thanks for the giveaway - looks like a great pattern and I can't wait to see yours develop! Hi Thelma ... You make some truly amazing quilts. I love swinging by your blog to see what you're working on next!! I can't wait to see your Birdseye quilt! My favorite quilt patterns would be Summer Wind and Home Sweet Home, both by the amazing Carrie Nelson. In fact, I haven't met any Miss Rosie patterns that I didn't like! My goodness. What a giveaway! Thank you so much. Well, I just finished one of Carrie's new Schnibbles patterns "Full House" and I want to tell you it is so dang cute and a breeze to make. I did it for a housewarming gift for my sister (sshh, it's a surprise). Right at the moment it's pretty high up on the list. I'd have to say Carrie's "Elizabeth" pattern. It is a beauty and again does up so perfectly. Good luck with the new quilt. I'm sure it will be fabulous. Your red and white quilt was spectacular. I've never seen anything like it. I love Carrie's patterns and right now I'm drooling over Eventide. I saw a top made out of red, white and blues and I 'm going to make a similar version once I've cleared out a few older projects. I really don't have a favorite pattern, but do love to make stars and pinwheels. I'm trying to finish a Dear Jane quilt (3 years and counting!). Thanks for a great giveaway! Bird's Eye has been on my 'to do' list since Carrie released the pattern. The daunting task of selecting fabric has kept me from jumping in with both feet. LOL Your wonderful kit giveaway would solve my problem. I've been sitting here trying to think of a favorite pattern and I'm finding it difficult to pick just one. Elizabeth by Carrie is definitely at the top. I'd have to say that my favorite quilt so far is a Christmas Stockings quilt from the book Tis' the Season. I loved making this quilt and loved it up on my wall. It is the only large quilt I have started and completed in one month. You are much better at deadlines than me, Thelma?! Birdseye has been on my to do list ever since I read Nicole's blogs about it so I'd love to win your giveaway. 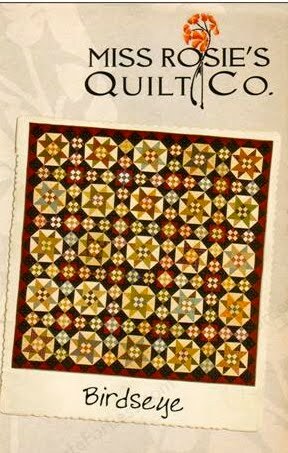 My current favorite pattern is Belle Meade by Bonnie Blue Quilts. I'm working on it right now and like both the pattern and the fabrics I'm using for it. I love how it's turning out. Your quilt and this pattern are beautiful, I would love to give it a try. My all time favorite pattern is Summer Breeze from Kim Brackett, but I also love almost all of Miss Rosies (Carrie's) patterns as well. My favorite quilt is "My Old KY Home" by Paula Barnes, but it was sure difficult to pick just one! I love making nine patches, too. I remember when Nicole was making hers and fall in love with the pattern then, but haven't made it.... too many new ones keep coming along. It would be fun to make it with you .... bet there are a few of us who would join you! When I see the name Birdeyes, it reminds me a very small town in Southern IN. Thanks for such a nice giveaway. The fabrics in the kit look great! Can't wait to see what fabrics you have selected! Carrie has some fabulous patterns. I'm especially hooked on Schnibbles. My favorite quilt pattern is Yellow Brick Road. It just takes fat quarters and comes together quickly. Especially helpful when you have a deadline. I fell in love with that pattern when I saw Nicole's version. I immediately bought the pattern but could never find the right fabric. Wouldn't mind the kit, to get me into making it. If I win, maybe we can do it together! LOL! My favorite quilt right now is Carrie's Elizabeth pattern (my Beth), but I also love my daughter's Shiloh quilt (by Bonnie Blue Quilts). I love stars!! My favorites are disappearing 9 patch and buzzsaw. I know this because I've made both of these designs 3 times! my favorite quilt pattern is anything with baskets in it. I love the current one you're working on! Carrie's patterns are all great, too. My favorite pattern I've made is Monterey Medallion by Terry Atkinson. I also doubled the size of the layer cake pattern, Hot Cross, from Schnibbles Times Two, and made a queen size. I have several other patterns by Carrie Nelson on my want-to-make list. I remember when several of you were making Toulouse and wish now that I had gotten the pattern. I enjoy your blog and am always inspired. Thanks for offering such a generous giveaway. I would love to make Birdseye! I LOVE this quilt! I'm surprised that there aren't more out there - bet there will be now that you have shown us how great it is! My favorite quilt is anything log cabin. I love all of Lori Smith's patterns, lots of neat Jo Mortons. Yep...I'm with you - can't pick just one! Thanks so much for the chance to win! Wow--pretty quilt! Even if it does have a squillionty pieces! I like a challenge. Wow!! I too love this quilt! Madeline is my favourite Carrie pattern...done in Rouenneries fabric of course! All time favourite?...geeze...is there such a thing?! Too many favourites!! Can't wait for yours to take shape!! Take care! It's so hard for me to pick a favorite pattern, but I enjoyed working on Paisley Parade, which was the cover quilt on Quilt Sampler Spring/Summer 2008. Birdseye is definitely on my Bucket List, and I think it's wonderful that you would share your kit with one lucky one of us! Thanks so much for the chance to win! Hi Thelma. Great giveaway...I was thinking that I can hardly afford to fund my own quilting projects, let alone give fabric away to others! lol You are generous!! 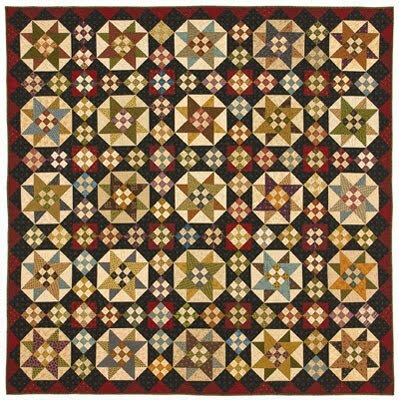 My favorite pattern is Stars for a New Day by Sue Garman. My friend Teresa made it and was entered at the AQS show in Des Moines. Beyond gorgeous. I have made so many quilts it is so hard to pick just one pattern that I like best. One of Miss Rosie's pattern that I truly love and have fabric set aside to use is 'Stella Blue'. Another one of Miss Rosie's is 'Ruby Slippers' which I did in pinks and browns. Very stunning! I love Miss Rosie's patterns and wish I had enough time in this world to make all the ones I have purchased. Thanks for the chance to win. I love reading your blog. You are so inspiring. Hi Thelma, I love reading your blog and being energized to go piece another quilt. Your quilts are beautiful. Thanks for sharing your love of quilting with us and your Birdseye Kit giveaway to one very lucky reader. Does my posting a comment as "anonymous" keep me from winning? My favorite pattern is actually a book with one quilt pattern. It is Scraps of Life by Helen Ogden Widener. It's a reproduction quilt that was originally made by Elizabeth Crockett, Davie Crockett's second wife. I really enjoyed making the quilt and its my favorite one. I'm looking forward to seeing the fabrics you've chosen for your Birdseye--it looks like a fun quilt to make (and very tempting!). I am trying to keep working on my applique, but am feeling the need to do some machine sewing. Will be making Hugs and Kisses by Jaybird Quilts as soon as my resolve weakens and I figure out color choices, unless you've lured me into trying the Birdseye! Oh, I love the Birdseye pattern. I have actually thought about it for awhile too. My favorite ones done are probably both Miss Rosie's (right up your alley). Elizabeth and Route 44. They both turned out great and I enjoyed the process all the way through. My favorite quilt is the one I just finished, Faceted Jewels, which I learned about on your blog. I did it with a light sage green background and all the pieces in jewel tones, mostly purples. I made it larger, 104" X 104" and it's beautiful. One of my favorite quilt patterns is also a Ms. Rosie. Summer Wind. It's on the top of my list to make. Hopefully soon! Choosing one, that is a very hard choice. I love Summer rental very much. I want to complete a double wedding ring quilt. I started a paper pieced on a very long time ago and I should get it back out and work on it. What a generous give-away! My all-time favorite pattern is Churn Dash. It can be made to look so different by changing the dark and light placement. And I love all of Carrie's patterns! They look sooo good and her directions are spot on. My favorite pattern is usually whatever one I've just finished. I have Birdseye but haven't got around to making it, perhaps because it is a little dark for me nad I can't mentally visualize it in a lighter palette. I do like your idea of Googling the pattern to find chronicles of others' experiences with it, excellent for getting advice and ideas. Right now my favorite is Crabapples by Bonnie Hunter. I've started piecing it using her "leaders and enders" but I'm not getting much sewing time lately, and it keeps calling my name!! Retreat is coming up in Nov., though, so maybe....! :-D You always wake me up to possibilities, T!! Love your baskets, and Miss Rosie is coming up alongside Bonnie as one of my alltime favorite designers! 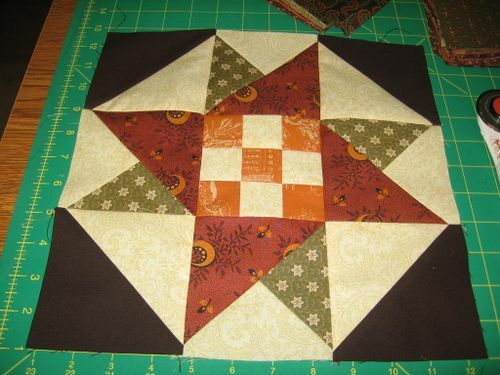 Right now, I am working on a Jacob's Ladder quilt that I am really liking. It is based on a quilt made by Bonnie Hunter that she calls Floribunda (not the Floribunda pattern that several bloggers are making right not). This is a very generous giveaway and I would be very excited to win it. I love doing Miss Rosie quilts. My favorite was Picnic. But, I also love doing misc. blocks and am finishing up one I did with anything that made me think "Summer" and consists of lots of different blocks...so it is kind of my own creation and means a lot to me. At this moment, subject to change, the favorite quilt I've made is Amber Johnson's Candy Hearts quilt (Moda Bake Shop). With the ruffle, it is very cute!! My favorite is Miss Rosie. I want to make every quilt pattern she has written. My favorite pattern of her is Route 44. Love, love, love Carrie's stuff!! -- Lisa C.
It's hard to say what my favorite quilt pattern is. I guess when I don't have a pattern in front of me, I'll make some scrappy star blocks to put together. Thanks so much for the giving us a chance to win this pattern and fabric. What a generous offer. If I can only pick one pattern to be my favorite, it's the double wedding ring. I've only pieced one and it's about 2/3s of the way quilted. But as a general rule, anything scrappy -- or appearing to be scrappy is right up my alley. I love your newest planned project! It's going to be wonderful. And lots of pieces... can't wait to see what your count is on it! My favorite pattern? hmmmmmmmmmmmm, let's see. It's so hard to pick, because ones you like and you grow and learn from them... but I think the one that is pleasing to me still, is Twist and Turn by Laundry Basket. There are several versions of this pattern but I really like the setting for this one. I made mine out of Fig Tree fabrics. It's hanging on my family room wall right now... and I taught a couple of classes in it and it was so fun to see everyone's versions and the different look you get using different fabrics. Birdseye has been on my list for quilte a while! I love all of Miss Rosie's patterns. I recently got the fabrics to make Brown Eyed Girl. Can't wait to start it. Sharon P.
I love the Birdseye pattern. My favorite quilt pattern is all the ones that have stars in them. Probably 95% of the quilts I have are stars or have stars in them. Love them. Another one of my favorite quilts I have is a SunBonnet Sue. My mom had 53 Sunbonnet Sue blocks made from old flour sacks stored in her cedar chest. When she died my two sisters found them and we split them up and went on a retreat and each made a quilt from the blocks. We thought about our Mom the whole time. Tears were flowing. Hi Thelma, I fell in love with Birdseye as soon as it came out, my problem has been deciding on fabric. I'm a pink & green lover so still looking for the just right collection! I'm a big fan of Miss Rosie Patterns - Elizabeth, Plan C, Ginger Belle, love them all! Melanie W.
My favorite quilt is usually the one I am working on at the time! Right now that means my Autumn Beauty is my fav! It is all maple leaf blocks in every fallish fabric I have! I do like projects that can be pieced one block at a time. When I have a small pocket of time, I can sit and make a quick block! I am hoping to get this top finished by Thanksgiving! you are amazing and so generous to give away all that. I knew Bird's Eye looked familiar, i have been following Nicole's blog for a awhile. I love making wonky made up blocks, crumb blocks or anything that Bonnie Hunter does. I have made her Star Struck and was quite happy with the results. I made Elizabeth by Miss Rosie's a couple years ago and it is still my all-time favorite. I would love to win this giveaway. Thanks for doing it. That new pattern is something else. I hope to be able to make something like that someday! I have just learnt how to quilt and took a class on how to make a Log cabin quilt. So i guess that is my favorite at the moment! Well after doing all the reading about it. I would love to win this and make this quilt. It is awesome. I thought that my favorite was my yet-to-be made Madeline "up-sized" in French General. All the fabric is sitting on my cutting table patiently waiting for me to start on it. But the Birdseye could be a close second.....I love both "starry" quilts and nine patch blocks. Thanks for your generous giveaway. That quilt is just lovely! The colors are so pretty and autumnal. My favorite pattern is a winding way quilt i am working on in reds and whites . Thanks for the generous give away and a chance to win. It's very to pick just one but my favorite would be Lonestar. I love reading your blog and am always inspired! You're so generous Thelma! I really love the pattern that you made where you combined two Schnibbles. That was genius and looked so gorgeous. Otherwise, I really like Lori Holt's patterns, like her Thanksgiving quilt or How to Build a Scarecrow. Thanks for an awesome giveaway! My favorite pattern is a Thimbleberries pattern, Rosebud, mostly because I made it while holding fussy twins many years ago. It reminds me of that precious time. My favorite? Today it is interlocking squares by Nancy Lee Chong. This was interesting reading for me. I have a Birdseye quilt kit from my local quilt shop which has been languishing in my sewing room while I recover from my seizures and Zao's death.... Zao's death being the longer recovery, and not finished yet! My kit has a dark chocolate background, which I prefer to black. I need to get started! Even Carrie's pattern intro seems to indicate a certain level of difficulty, though.???? Another project I have in mind is to make the pattern Rosettes, ( Fig tree quilts) using 3 Sister's Etchings, for my king size bed. So many projects, so little time! ( I learned more about that time factor this summer. ) I usually don't make patterns twice, there are so many, but I LOVE Rosettes! My favorite quilt tends to be the latest quilt that you or Nicole post! I am a sucker for anything with triangles. I'm so tempted to try the Door County Cherry Baskets but now that I see Birdseye.... I love almost anything Jo Morton, Kim Diehl, BBD or Miss Rosie. I'm a Schnibble junkie with my favorites Picnic and State Fair. I recently got Carrie's new book and would love to make a large size Picnic if I can decide on fabric. I can't wait to see your Birdseye pattern come together. You always do such a good job on your quilts. That's a wonderful giveaway - very generous of you, Thelma. The quilt I have wanted to make for ages and am determined to do SOMEDAY is Judy Martin's Shakespeare in the Park. It's in her Creative Pattern Book, and it's a combination of a Snail's Trail and, I think, a Virginia Reel. It's gorgeous! What a great give away! Thanks for the chance to win. My favorite pattern is anything with stars. I want to make almost every one of the Miss Rosie patterns. They're all so yummy. But the pattern that has most caught my fancy at the moment is SWOON by Camille Roskelley. Really, it's so striking, it will just make you swoon. Can't wait to see your progress on Birdseye. You are such a determined, fast and talented quilter! My favorite quilt was a pinwheel quilt I made for my niece's baby shower. It was my first with prairie points too. The colors were happy and include polka dots. Thank you for the opportunity to win a more challenging project which I'm sure, will help me advance as a quilter. One quilt I would really like to make is Carrie's Elizabeth. I have the Wuthering Heights fabrics, but haven't been able to move it up in the queue. I, really, can't choose just one. It would be like choosing a favorite child, impossible! Birdseye has been on my do list since I first saw the pattern. I love anything by Carrie. What's not to love? She's amazing and so are her patterns. I also, want to make some of the patterns from Bonnie Blue. My sister and I read your blog and she says "you and Thelma are a lot alike." I take that as a compliment! Thanks a bunch. Love your quilts and your blog. I really like Bonnie Blue Quilts designs. Sallie's Quilt is one of my favorite. Thanks for the great giveaway! I am very new to quilting...close to finishing my second quilt. I love the Birdseye pattern; love anything with stars. My current favorite wish list pattern is Swoon. Love all the quilts made with it that I've seen in blog land lately. Wow, I'd love to make Birdseye. It is quite awesome. I realized that most of the quilts I've finished so far are samplers! But my favorite to date is a pattern called "Cool Cat Craze," designed by Stacy @Cubic Design for P&B Textiles (free pattern). It went together so easily and was so bright and fun! I have quite a bit of the Cool Cats fabric left and have been thinking of making a second one -- the first one went to a fund-raiser. This is a great pattern; one of her best, I think. My favorite patterns are two, traditional ones, the ocean waves, and storm at sea. Why I've been quilting for over 20 years and haven't made them, I can't imagine. Your giveaway is beyond generous! I really like Elizabeth and Plan C by Miss Rosie Quilt Co. Thanks for the giveaway! I'm really looking forward to making Wild Air by Miss Rosie out of Park Avenue. I have all the fabrics, I just need to find the time to work on it. There are a gazillion 1" x 2" flying geese so it will be a long term project! How nice of you to offer the kit and pattern! I hope you're version turns out exactly as you hope it will. 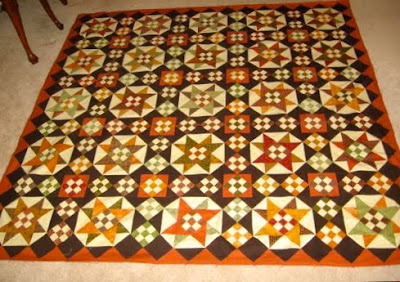 What a beautiful quilt pattern, I love anything "stars." My favorite and what I have made many times is "Lucky Stars" by Atkinson Designs...it sews together so well and so fast. So pretty quilt you have! Definitely want to make it in the near future. I'm just started working on Eventide quilt. I hope to use your pretty stack of fabrics to work on Birdeye quilt on my next retreat. I'm looking forward to seeing your Birdseye quilt when it's completed! My all time favorite quilt pattern is....Come On-A My House....designed by the great Carrie Nelson. I love stars and also pinwheels. The pattern I have made the most is Double Pinwheel, so if I had to pick a favorite that would be it. The stars and nine patches in Birdseye look great together. Sure would be nice to win it. Thanks for the opportunity! I am working on Bella Rosa by Carrie Nelson. This is my first Miss Rosie pattern & I am using Three Sisters fabric. I am making 6 blocks every month. I would love to work on the Birdseye quilt & try it your way--set a deadline and go for it! I think any pattern with pinwheels would become my favorite, I love them so much. I have done several double pinwheels. I love your blog and thanks for the giveaway. My most favorite quilt started out as a Christmas gift for a friend in colors that went with her decor (not mine). When I finished it I couldn't give it up. Five yrs later it is still my favorite. It was from a book so I'm not sure the name of the pattern. I had to scramble to make another quilt for my friend before she came to visit for Christmas. My favorite quilt pattern at the moment is Eventide and of course it is because I was able to see all the different fabrics and colors that everybody used in your quilt-a-long. It is very inspiring to see how others interpret the pattern and that makes you want to plunge in and try something that your normally wouldn't even look at twice. I love Miss Rosie's patterns too. Birdseye looks like a good one. The pattern I've been wanting to make is by Fig Tree Quilts in the Fresh Vintage issue #14, it's called Laundry Baskets. Actually the basket tips are made the same way as the star tips in Birdseye. I just finished "Kansas Troubles" by Fons and Porter; a large applique quilt, and a scrappy quilt. My favorite is definitely the one I'm currently working on. I'm always thinking of the next quilt I'm going to make. Love the Birdeye pattern! Oh, picking out a favorite pattern is difficult! It's like asking me to pick my favorite child!!! lol Okay, I will try to add a comment or two about favorite patterns! I love the 9 Patch because it is so versatile and it's a classic that will be around for a long time! I've made several 9 Patches (including the Disappearing 9 Patch). But my favorite quilt is any that has a STAR block! I love Terry Atkinson's "Lucky Star" and Carrie's Plan C...and a host of other star patterns! I'm relatively new to quilting so I don't have too much pattern experience. But, I did order Swoon by Camille Roskelley. I love it! I just completed my first block and it came out pretty darn good! LOVE your blog. Your quilts are inspiring! I used Miss Rosie's quilt "Plan C" to make my first grandbaby's homecoming quilt...love her patterns. I'm enjoying looking at your quilts. I haven't tried a Miss Rosie pattern but think the Birdseye has to go on my list. I love anything stars. I'm working on 'Lancaster" by Bonnie Blue. Your cherry baskets has to go on my list as well. I purchased the Toulouse pattern after seeing it on another blog and i hope to make it one day. Probably my favorite "can't wait to make it" quilt pattern. Hi Thelma, I love anything by Minnick and Simpson,Schnibbles or any of Carrie's patterns...hard to choose one! Birdseye looks like fun,I hope I win. Thanks for being so generous and I love your blog. My favorite quilt that I have made is Plan C by Carrie Nelson. I've made the large and small version. I would never have gotten so hooked on her patterns if it weren't for you and your wonderful blog! Thanks! P.S. I'd love to try Birdseye. My favourite pattern that I've made is New York Beauty by Karen Stone. I have 2 finished quilts and they are truly wonderful - both bright but one is brights with black and white, and the other is mostly a moda collection by Cheri Strole. Tag Sale by Carrie Nelson is a close third with Paris Flea Market fabrics. I have a lot of Carrie's patterns calling my name and Birdseye is one I've always liked. I love the birdseye quilt. I love all of Carries patterns but my favorite quilt would be Eventide. I did the sew a long with you and just love my quilt!!! Thanks. Oh! oh! oh! Birdseye is lovely! I love to make it but November may just be too busy! Oh well, maybe I could just make time! I still really love the Eventide pattern. I have it quilted. And now, it's time for the binding. Maybe I could do that this weekend. No, can't DS birthday is this weekend! I want to try to make the 15-layer cake(maybe it's 14?) on Bakerella. Thanks for hosting such a lovely pattern/fabric giveaway. Elisabeth by Miss Rosie's quilt company, all cut out and waiting to dance. Synchronicity and something to make you laugh. I have to say I like friendship stars and made a very large one for my daughter years ago. But of all the recent patterns I have seen I still like your Hometown Christmas the best. It is beautiful and I hope to make one someday. Georgeann. My current favorite is from a magazine - the cover quilt, blue and white, scrappy shirtings... love it. Flying Geese pattern or the northwind block have to be my favorite. When I think of quilt blocks ---they are the ones that pop up. Colors-- Green Navy red-- the colors may change, but the blocks never do..count me in---have a Great Fall. I can't say that I have a favorite quilt pattern-there are just to many gorgeous quilts in the world I want to make. I've been quilting a long time and only recently made a couple log cabin quilts that turned out really great. I am loving the Birdseye pattern. I think it would look great in my guest bedroom. I think I would have to pick a pattern called English Country Garden. I hung it on my bedroom wall about ten years ago and it still hangs- I LOVE it. It is full of flowers and plaids. I do not remember the artist though. Another favorite was an applique design by Blackbird Designs called "Samples from the Past". Nine applique blocks divided by sashing-pretty. But, I am loving Birdseye. Lots of great piecing. Fingers crossed that I may win this lovely kit:) Thanks! I'm happiest when I'm cutting 'n sewing 9patches. I started quilting with Thimbleberries fabrics and still seem to choose those darker homey colors. I Follow your blog. Favorite quilt pattern?! Now that's not fair. It's like having to pick a favorite kid! I'm not sure I can even narrow it down to a half-dozen! I love any star pattern, simple or even the more complex! All of the patterns Rosie puts out, love! I guess I would have to say my favorite pattern is always the one I just finished! Today, it's a simple little 9 patch I just finished for my grandson! Thanks for the great blog. Enjoy it very much! Thelma, you have the greatest giveaways! I think my favorite quilt pattern would be a plain old schoolhouse. Just an all-time favorite plain and simple. I am really impressed with your goals! (something I need to do more of in order to get some unfinished quilts finished!). My favorite quilt I've made would be "Swoon", by Thimble Blossoms. It was so much fun to do - like making 9 small quilts and putting them together into 1 big quilt! Thanks for the great give-away, and all the inspiration! My favorite go to pattern is Lucky Stars by Atkinson Designs. Just change the fabric and you change the look. My quilt group has made dozens of these using patriotic fabrics (for soldiers), baby fabrics, 30's fabrics, you name it and it looks great. Thanks for the chance to win this great giveaway! I also love the pattern Lucky Stars by Atkinson Designs. I finish one this past summer. I love any from Miss Rosie as well. Thank you for being an inspiration. I have finished Carrie Nelson's Stella Blue quilt in holiday colors and love it. Right now I'm working on a Sylvia's Bridal Sampler - and really enjoying the variety of blocks. But I also enjoy minuature quilts - and love the patterns from Sew unique creations. I LOVE the fabric bundle that you are sooo generously willing to give away - I'd love to make a Birdseye too - especially with the fabrics already picked out....Sometimes I stress too much trying to pick the right colors - so I'd love to have hte pile already chosen! I can't wait to see this finished! I know it will be fabulous.